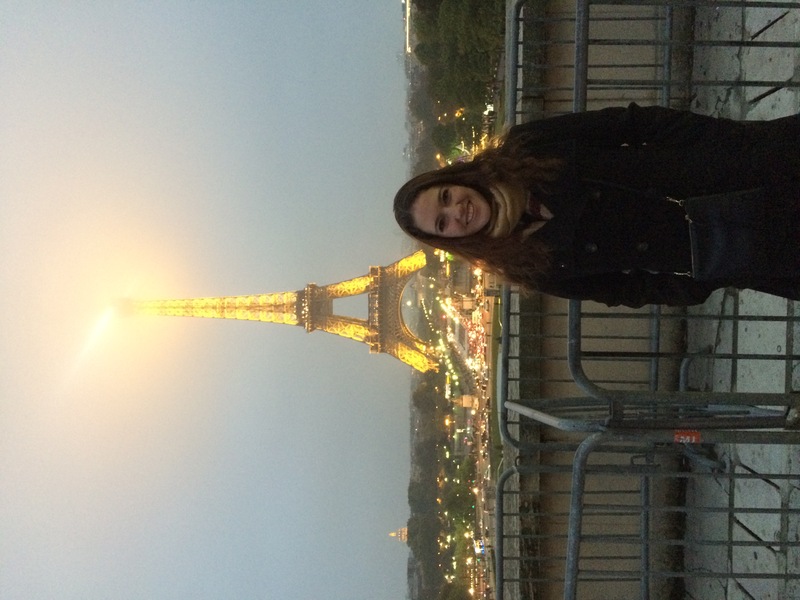 What a week in Paris! I’m a day late on this blog update because it’s been a whirlwind coming home, unpacking, and getting back into the swing of classes. It was such a wonderful opportunity to spend a whole week exploring a new city, and so good to spend time with my Uncle Jeff and Uncle Brent. We definitely kept busy! So much fun with my uncles this week – and so much great food! Monday we set out for the Parc Des Buttes-chaumont for some exploring and some great views. We walked all over, took pictures, and watched a woman feed birds right next to a “don’t feed the birds sign.” The leaves aren’t really turning in London yet, but Paris was full of lovely fall colors! After that we found our way to the Chapel of the Miraculous Medal, Shakespeare’s Bookstore, and a great falafel place for lunch. Then we spent the afternoon at Luxembourg gardens enjoying the views and the statues. 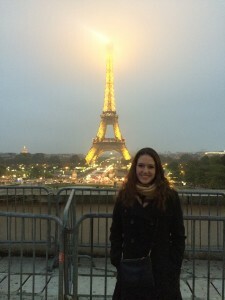 Tuesday we spent most of the day at Versailles, mostly inside because it was freezing! In the evening, we came back into the city and watched the sun set from the roof of Printemps, a department store. 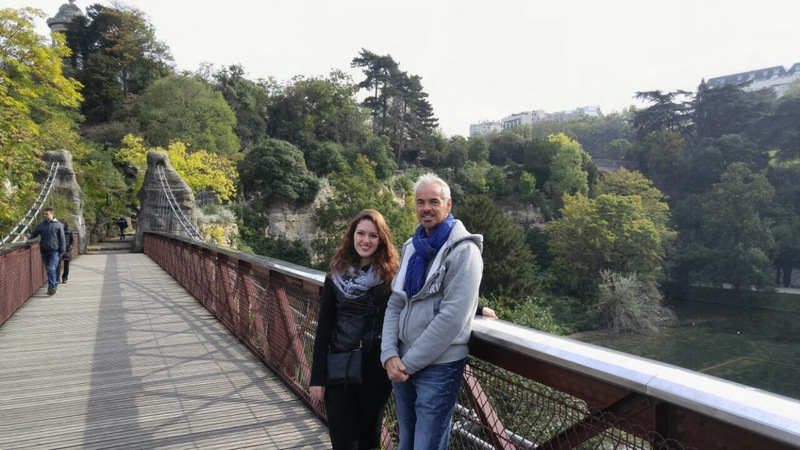 Parc des Buttes-chaumont with Uncle Brent. Wednesday was our busiest and definitely my favorite day. 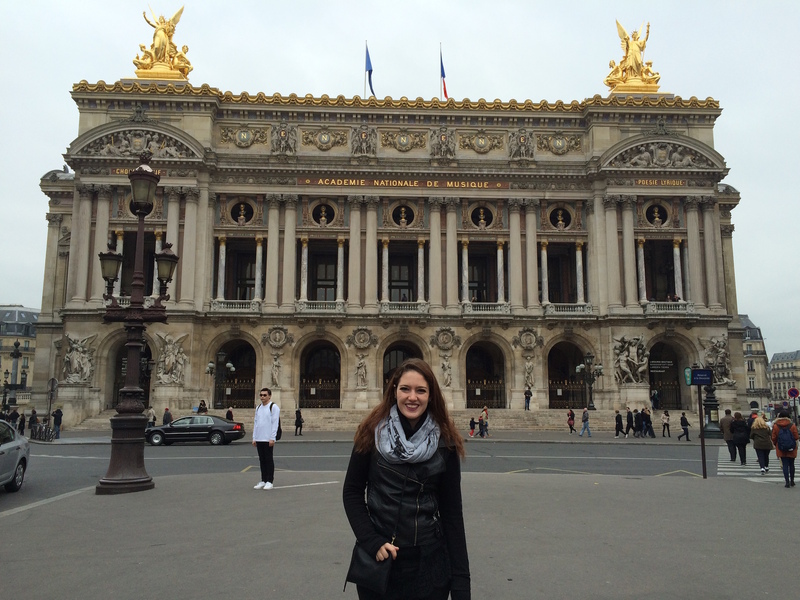 We spent the morning at the Garnier Opera House. I expected the beautiful architecture, lavish ballrooms, and even the giant, colorful Chagall painting on the ceiling of the auditorium, but I did not expect them to have costumes on display! They had dance and opera costumes from Sleeping Beauty, The Marriage of Figaro, and Balanchine’s Jewels, among others, and I was so excited to see such beautiful pieces on display and to be able to appreciate them up close in a way that an audience never would during a performance. That afternoon we went to the Louvre, which was honestly a blur of incredible art from all around the world and throughout history. My favorite piece was the Winged Victory of Samothrace, a recently restored ancient Greek statue. I was completely struck by its size, the detail in the sculpting, and the sense of movement and power the artist managed to convey through marble. 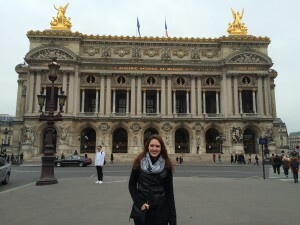 I LOVED the opera house! We spent most of our day Thursday shopping! We also went into Notre Dame, which was super beautiful as it was starting to get dark outside. Friday we saw more amazing art at the Musee d’Orsay, including some works by Van Gogh, Renoir, Degas, and Monet (their Impressionist collection was huge). They also had a temporary exhibit on the beginnings of women’s presence in photography, which was obviously great and right up my alley. Saturday we went to another Gothic church, St. Denis. My uncles had never been there before, and we studied it in Honors seminar my freshman year, so it was an interesting experience all around. Most of the French kings from the 10th to the 18th centuries are buried there. It is also considered the first Gothic church, so it’s definitely exciting architecturally, too! That afternoon we shopped and went to some sites from the movie Amelie, and then finished off a great week with a delicious dinner at my uncles’ favorite restaurant, Chez Toinette. Sunday I packed up and my uncles took me to the train station. It was a quick journey back to London, and I was surprised how much the subway and bus ride back to my flat felt like coming home. I can’t believe this adventure is halfway over! !